The winter sports of skiing, snowboarding, and even speeding down a hill on an inner tube are great fun. But to enjoy them fully, you need warm, waterproof clothing that is still lightweight enough so you can move. It's important to take care of these clothes so they will last from season to season. 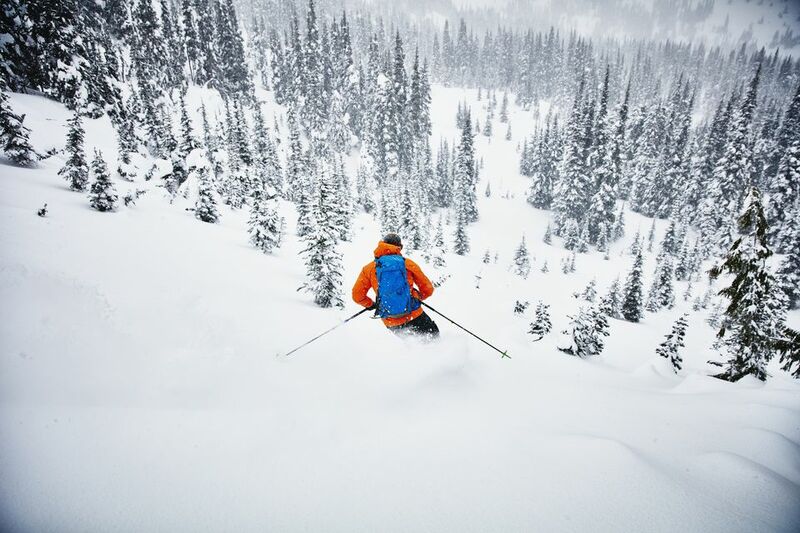 The best ski wear is both waterproof and breathable. No one wants to be wet from the outside elements or from perspiration. Lightweight ski wear is usually made of nylon fabric that the manufacturer treats on one side with special polymers that lower the surface tension of the fabric, causing water to bead up and roll off. The other side of the fabric is treated to help perspiration escape. This breathability keeps you both dry and warm since perspiration is moved away from the body. Some people don't ever wash their ski clothes, but washing a water-repellent jacket a couple of times per season is actually helpful. During normal wear, the clothes accumulate soil from external sources as well as from your own body that can lessen the performance of the finishes. The special finishes on the inside of ski wear have microscopic pores that are too small to allow liquid water to pass through, but large enough to let water vapor escape. Dirt and grime can disrupt the waterproofing and breathability by clogging the pores and preventing water vapor from escaping. Cleaning opens the pores and improves clothing performance. Almost all ski pants, jackets, and jumpsuits are washable but check the labels for cleaning instructions. This is especially important for waterproof clothing. Ski clothes should not be dry cleaned because the cleaning chemicals are too harsh for the waterproof coating. First things first, empty the pockets of lip balm, tissues, and anything that could stain your fabrics. Cut off or untie any lift tickets or passes. Remove any inner linings or hoods. Zip up all the zippers, snap the snaps and close all Velcro fasteners to prevent snagging and tears during washing. If you have a grease stain or food stains like chocolate or mustard, pretreat the stain before washing. If your ski clothes can be machine washed, use cold water and the delicate cycle with a low spin speed. A gentle detergent like Woolite, Dreft, or one specially-formulated for waterproof outerwear should be used. Do not overload the washer and only wash similar fabrics together. (No heavy jeans or linty towels). Do not add fabric softeners or bleach of any kind. If you feel you were too heavy-handed with detergent and the clothes feel soapy, run them through a second rinse cycle. After washing, run just the outer jacket and pants through a second wash cycle using an in-wash waterproofing solution. Be sure that the waterproofing solution is designated for clothing, not tents or sleeping bags. Use cold water and don't put other clothes in the washer. NEVER place your ski clothes in the dryer. After washing, hang them to air dry away from direct sunlight or a heat source on a sturdy hanger that will not rust or bend. Ironing will not be necessary because the weight of the fabric will pull out most wrinkles. If you do not want to use or don't have an in-wash waterproofing product, wait until the clothes are completely dry and use a spray-on water repellent product. Between washings, hang ski jackets and pants to dry well. Brush away any topsoil and wipe away visible stains with a clean, damp cloth. If you like a down jacket, periodic cleaning will "fluff" the down and increase its warmth-producing qualities. There are horror stories about wet down that never, ever dries but if you follow these steps, your down jacket will last for many years. Gloves or mittens are a must for protecting your hands. They, of course, get more soiled than other outerwear. If you have water-repellent gloves, they should be hand washed. One easy way to do that is to put them on and wet them down with cold water. Put just a drop of mild soap (same choices as your jacket) in the palm and wash "your hands". Tough stains on the gloves may need a bit of extra soap and extra rubbing to remove them. Never use fabric softeners or bleach. Keep your hands in the gloves, which helps them hold their shape, and rinse very well with cold water. To clean the inside of the gloves, invert the gloves if possible and repeat the steps. Or, wipe down using a clean white cloth dipped in the soap mixture. Rinse very well. Gently squeeze the water from the gloves, never wring because this can damage the fabric. Air dry away from sunlight and high heat. To speed drying, use clothespins to hang the gloves from the fingertips so that water runs out the cuffs. To improve water-repellency, use a spray-on water repellent. If the gloves have leather palms, use a mild leather cleaner and when the leather is dry, treat with a leather restorer to keep it supple. Even if you didn't wash your ski wear during the season, give it a good cleaning before storing away. Be sure that everything is completely dry before storing in a cool, dry area to prevent mildew and you'll be ready to hit the slopes next year. Are You Dyeing? Do It Right. Do You Need Enzyme Presoak Laundry Products?